Wear of polyethylene is widely recognized as a cause of osteolysis and failure in artificial hip joints . Recent studies of tissues surrounding knee prosthesis  have shown the accumulation of micron and sub micron size polyethylene wear debris, at similar levels to that found in the hip, hence indicating the potential for longer term osteolysis. In the hip damage or scratching to the femoral counterface has been shown to accelerate polyethylene wear  and it is now recommended to use alumina ceramic femoral heads, which arc more damage resistant and can deliver lower long term wear rates . Similar damage has been found in knees . 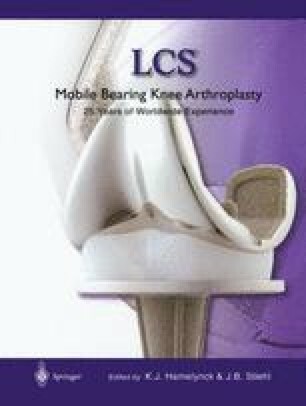 The complexity of the femoral and tibial tray geometries in the knee do not readily lend themselves for replacement of the metallic bearing counterfaces with monolithic ceramic- materials. An alternative approach is to modify the polished metallic bearing surface with hard smooth ‘ceramic like’ coatings.